I made you another salad. This time it’s an Easy Cabbage Salad. I know we are headed into November soon, but it’s still warm here in Texas. It was actually 90 yesterday! So salads it is. 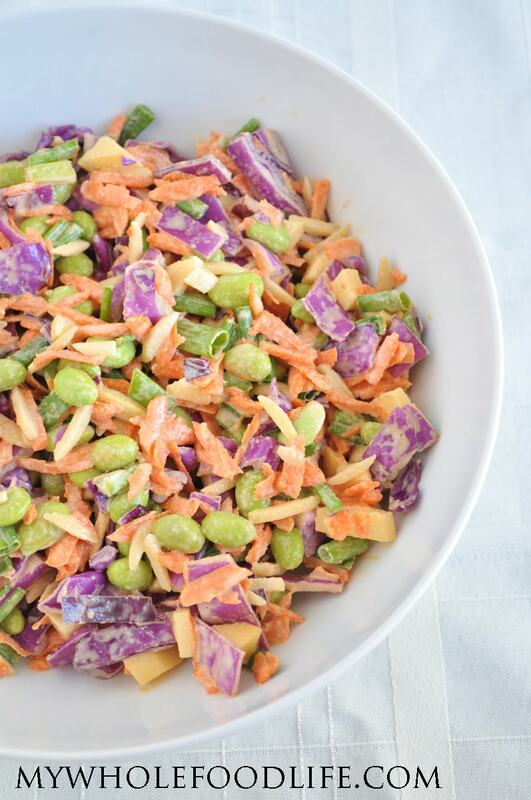 This Easy Cabbage Salad is vegan, gluten free and can be made paleo if you omit the edamame. The tahini dressing is so good! It would also make a great dip for veggies! It would also make a great dip for my spring rolls. We whipped this salad up in no time at all. I hope you enjoy it as much as we did. If you are a lover of all things salad, you may also enjoy this post. If you avoid soy, you can probably use green peas in place of the edamame. Mix all salad ingredients in one bowl . Whisk together dressing in another bowl . Pour dressing onto the salad and toss well. Should last at least 4 days. This looks yummy, especially with the apples for a little contrasting sweetness. I don't have any mirin. Is there anything I could substitute? Thanks!! You can add a touch of honey or maple syrup. Mirin adds a sweetness to balance out the acidity in the dressing. do we need to include edamame or can we use something else? I mention that in the post. You can replace the edamame with peas if you avoid all soy. This salad is so bright and beautiful and the tahini dressing sounds delicious! Love the addition of edamame here :-) Looks so much more tasty than a standard coleslaw! Pingback: Cabbage Apple Chopped Salad with Tahini Dressing - Are You Kitchen Me? !